I admit it: I love KFC! Our Daisy colleagues are really, really smart. I think this is a really good idea, don’t you? I suppose if Intellectual Property ninjas sent from Kentucky by The Colonel himself rappel down from the ceiling to try and kill this campaign with The Death of A Thousand Writs™, then that will make the news in a big way, which is — what? Free advertising? Probably with a sympathetic press, too. So it’s all good, even if it goes wrong. Right? Looks OK to me trademark and copyright wise. No visible barrel in sight — and may Lisa get all her opponents over said barrel! And the green bottle, why? That looks pretty close to the real thing. Maybe put a maple leaf behind her, then you could always claim it was just a flag, not a barrel. And do you really want to associate her with greasy fried chicken? But it definitely sticks in my head. I’m undecided whether I like it or not. If I were on the opposing campaign team, I would love that slogan. It offers so much to spin with. Watch it, anonymous commentor. I can find you and name you. And that would give her campaign a lot to work with, too. For what it’s worth, if I were ever to run, that would not be my slogan, nor my logo. Lighten up, people! Sorry, but I love KFC hot, or better cold . . . or, are we not talk’n chicken here? This isn’t another band name acronym is it? We did a taste test of KFC vs Popeys and Mary Browns. KFC came in last. KFC is still good but Popeys was amazing. 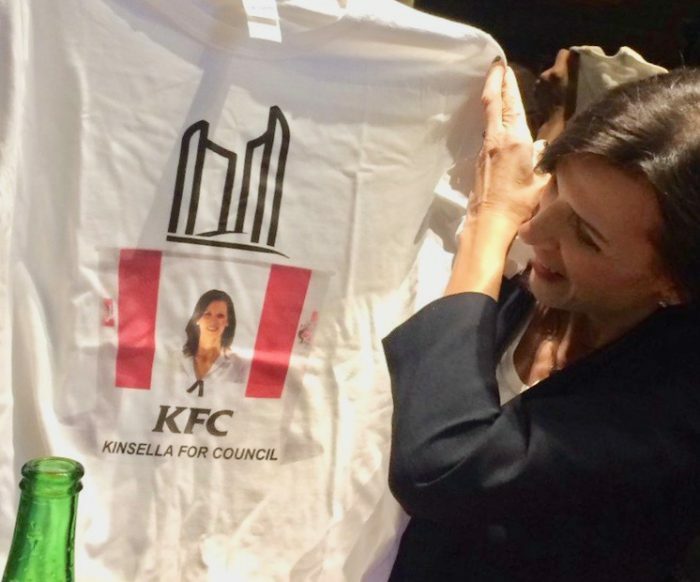 However slogan wise that KFC is pretty cool should Ms Kinsella run.